During my childhood days I hate eating keerai (Greens/Spinach) and avoided it simply without knowing its significance. When I grew up my food habits changed and as all of us, focused on health related stuffs. I still hate to eat greens but for healthy intake, I started to have them with other ingredients like dal, paneer, potato and more. 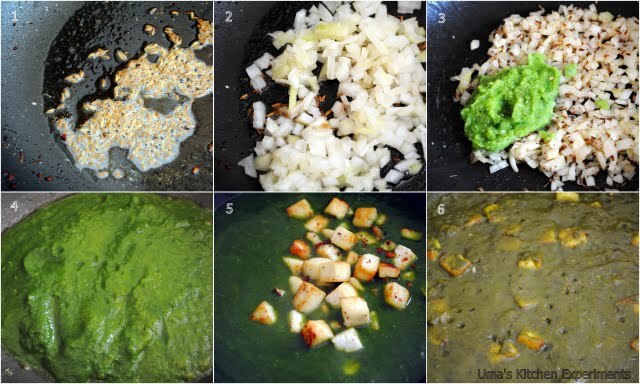 Palak Paneer is one such gravy I usually have which is the combination of Spinach and Paneer. This rich creamy healthy gravy is prepared using Paneer (Indian cottage cheese) cooked in Palak (Spinach) of pureed form. It pairs well with roti but I enjoy this gravy with steamed rice too. Try and enjoy! 1) Remove the stems from spinach and clean them first in running water (Use colander here) and then wash it as usual. 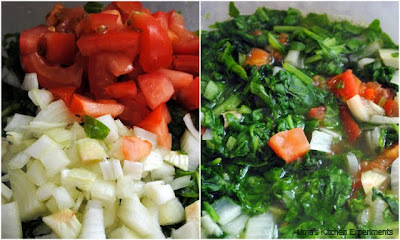 2) Chop it finely and microwave it for 3-4 minutes with chopped onion, tomato and salt. You can use your desired way to do this. But don't forget to sprinkle handful of water before doing so in all the methods. Cool and grind it to a fine paste. Keep it aside. 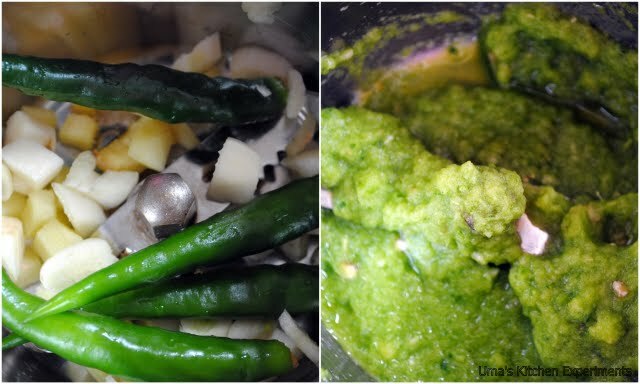 3) Grind ginger, garlic and green chillies to a fine paste and keep it aside. 4) Heat a tablespoon of oil/butter in a wok and brown the paneer slightly. 5) Transfer the paneer to another plate and throw cumin seeds in the same wok which has the remaining butter/oil. 6) When they sizzle, add onion and saute till they are translucent. 7) Add ginger garlic paste (as said in step 3) and saute for 2 minutes. 8) Add the spinach paste (as said in step 2) and boil it. 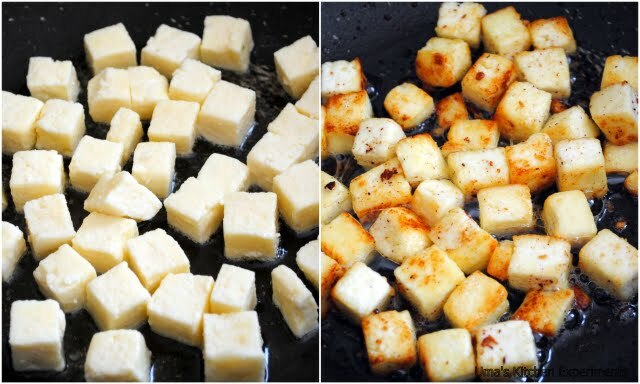 9) When it is boiling, reduce the flame and add salt and paneer cubes. Cover and cook for 5 minutes to make paneer to absorb the juice from spinach paste. 10) Open the lid and cook for 2 minutes by stirring and remove from heat. 11) Serve hot with roti. Sending this recipe to Tickling Palate's Subzis for Rotis. my daughter loves this very much. ur recipe is similar to mine except that i dont add ginger. first click is very nice. Healthy recipe with Spinach.. yet to try this.. As my son likes keerai stir fry itself, I do not have to worry much to try for other methods.. Fantastic clicks.. Nice presentaion.. I always adore ur clicks..
One green veggie dish i never made a fuss on eating since i was a kid!!! A very nice recipe, tasty and healthy. Looks so delicious, love the step by step clicks. Nice picture and recipe is very nice too!